I don’t really eat pies with the filling in mind. For me it’s all about the pastry mixed together with custard and a bit of the fruit juices – that makes the perfect mouthful of pie and any chunks of soggy fruit just get in the way of my pleasurable experience. This winter though, I’ve become unhealthily attached to roasted rhubarb. I’ve been eating it with yogurt for breakfast, using it to make a British Bakewell classic and drinking rhubarb soda to pep me up for the last leg of the bakery shift. 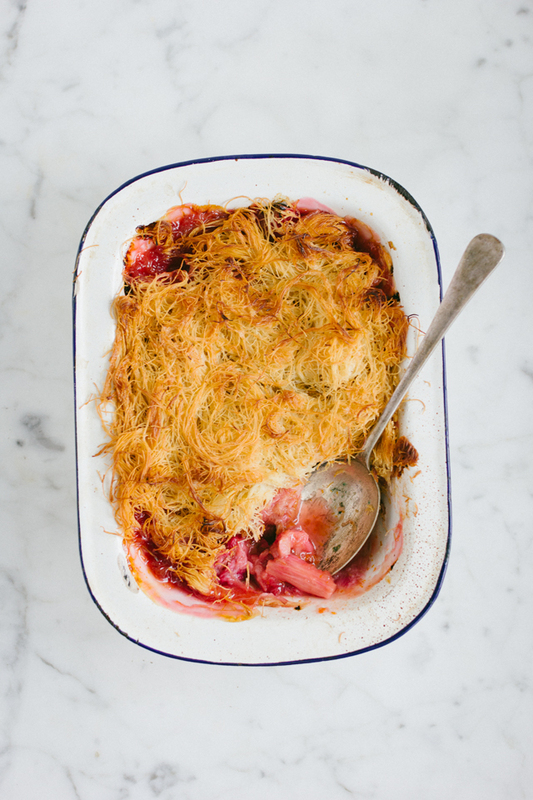 I’m even feeling a bit anxious for when this forced Yorkshire rhubarb season draws to a close, other roasted fruit just doesn’t offer the same texture and tartness – even if they are much cheaper. 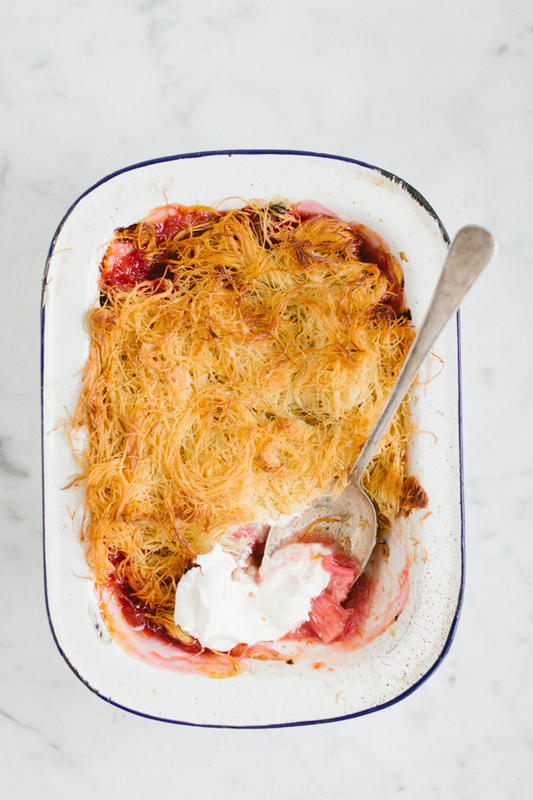 You could say that this is more of a crumble than a pie, and the kadaif pastry acts as the crumbly and crunchy topping. But for the sake of the latest running theme on the ol' blog, let's call it a pie. Kadaif, also spelt kadayif, is a shredded filo pastry and you can find it in most middle eastern supermarkets. It’s usually baked in butter and then soaked in sugar syrup in the popular Kanafeh dessert, but I’ve tossed the pastry in butter and sugar to keep it sweet and crunchy, which I think works better with the soft filling. To go alongside this strange Turkish/British fusion is a dollop of Kaymak – buffalo milk that has been boiled down for hours until thick, aka clotted cream. I just ate some of this for breakfast, and as I write this I’m experiencing a sugar comedown, but it is totally worth it. This thing is VERY tasty indeed. Preheat the oven to 160C/180F. 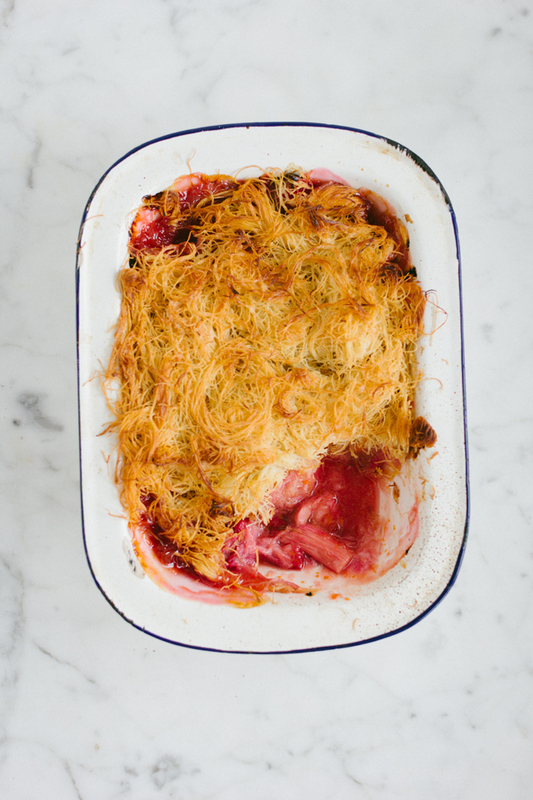 Put the rhubarb chunks, sugar, cornflour and orange zest into the pie plate and toss to evenly coat the rhubarb. Put the melted butter, kadaif and sugar in a large bowl and use your hands to mix, making sure the pastry is coated well. 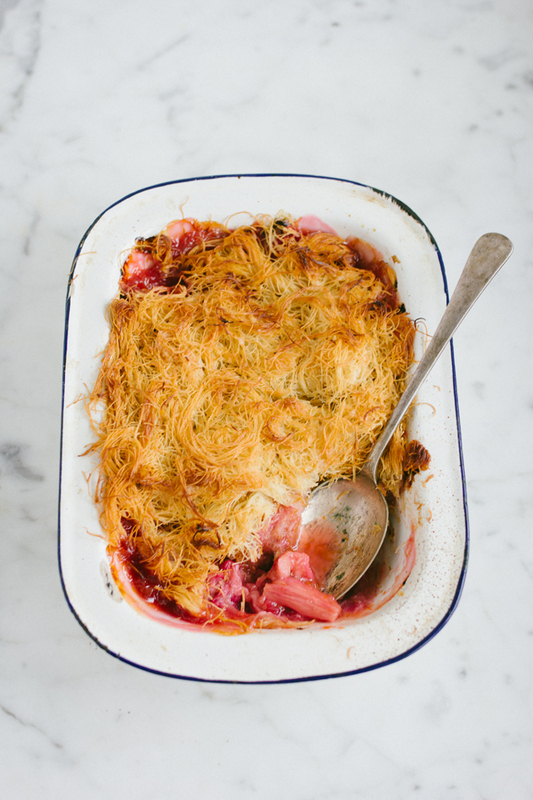 Place the kadaif on top of the rhubarb and spread it out. Leave some gaps around the edges so the rhubarb juices can peak through the pastry as it cooks. Bake for 30 minutes, or until the top is golden and the juices are bubbling. Serve warm with a dollop of kaymak, clotted cream or custard.